Zare Mehrjerdi, Y., Yazdekhasti, A. (2017). Two echelon-two indenture extended warranty distribution network under imperfect preventive maintenance policies. 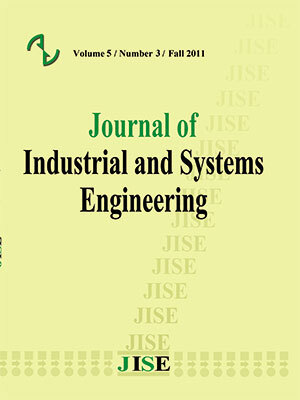 Journal of Industrial and Systems Engineering, 10(4), 69-95. Yahya Zare Mehrjerdi; Amin Yazdekhasti. "Two echelon-two indenture extended warranty distribution network under imperfect preventive maintenance policies". Journal of Industrial and Systems Engineering, 10, 4, 2017, 69-95. Zare Mehrjerdi, Y., Yazdekhasti, A. (2017). 'Two echelon-two indenture extended warranty distribution network under imperfect preventive maintenance policies', Journal of Industrial and Systems Engineering, 10(4), pp. 69-95. Zare Mehrjerdi, Y., Yazdekhasti, A. Two echelon-two indenture extended warranty distribution network under imperfect preventive maintenance policies. Journal of Industrial and Systems Engineering, 2017; 10(4): 69-95. Nowadays, offering extended warranty is considered as a lucrative source of income from the perspective of the after-sale service providers. Meanwhile, the main concern is presence or absence of base warranty and strategies adopted by the manufacturer during this period. Moreover, extended warranty structure must be responsive and customer oriented, which not only control the services cost but also to handle the customers’ requirement in a timely manner. In this paper, an extended warranty distribution network is designed from the perspective of a third party (3P) for supporting multi-indenture products in conjunction with base warranty. The proposed network is two-echelon; in this regard, a depot repair center is considered as the first echelon and a number of operational repair centers are selected at the second echelon. In order to decrease the cost of maintenance and spare parts logistics, a novel imperfect preventive maintenance approach is established based on the concept of virtual age. The third party aims to determine the optimum level of spare parts for each component of products at each repair centers in a way that: (1) total expected backorders is minimized (2) total maintenance and retrieval costs of product components are controlled. For optimizing the proposed model, an exact hybrid solution approach regarding Branch-and-Bound algorithm and Variable Neighborhood Search is presented. The obtained results showed the presence of a base warranty on a product has more advantages for third parties even without preventive maintenance. Ashayeri, J. & Tuzkaya, G. (2011). Design of demand driven return supply chain for high-tech products. Journal of industrial Engineering and Management, 4, 481-503. Ashayeri, J., MA, N. & Sotirov, R. (2015). The redesign of a warranty distribution network with recovery processes. Transportation Research Part E: Logistics and Transportation Review, 77, 184-197. Basten, R. J. I., Van der heijden, M. C. & Schutten, J. M. J. (2012). Joint optimization of level of repair analysis and spare parts stocks. European Journal of Operational Research, 222, 474-483. Batarfi, R., Jaber, M. Y. & Ajazzari, S. M. (2017). A profit maximization for a reverse logistics dual-channel supply chain with a return policy. Computers & Industrial Engineering, 106, 58-82. Bouguerra, S., A. Chelbi, & N. Rezg,. (2012). A decision model for adopting an extended warranty under different maintenance policies. International Journal of Production Economics, 135(2), 840-849. Chang, W.L. & J.-H. Lin. (2012) Optimal maintenance policy and length of extended warranty within the life cycle of products. Computers & Mathematics with Applications, 63(1), 144-150. Costantino, F., Di gravio, G. & Tronci, M. (2013). Multi-echelon, multi-indenture spare parts inventory control subject to system availability and budget constraints. Reliability Engineering & System Safety, 119, 95-101. Cox, D. R. & Smith, W. L. (1954). On the super position of renewal processes. Biometrika, 41, 91–99. Esmaeili, M., N. Shamsi Gamchi, & E. Asgharizadeh. (2014). Three-level warranty service contract among manufacturer, agent and customer: A game-theoretical approach. European Journal of Operational Research, 239(1), 177-186. Fritzsche, R. & Lasch, R. (2012). An Integrated Logistics Model of Spare Parts Maintenance Planning within the Aviation Industry. World Academy of Science, Engineering and Technology, 6, 1-10. Gallego, G., Wang, R., Ward, J., HU, M. & Beltran, J. L. (2014). Flexible-Duration Extended Warranties with Dynamic Reliability Learning. Production and Operations Management, 23, 645-659. Hassanzadeh Amin, S., & Zhang, G. (2014). Closed loop supply chain network configuration by a multi-objective mathematical model. Int. J. Supply Chain Modell, 6, 1–15. Heese, H.S.. (2012). Retail Strategies for Extended Warranty Sales and Impact on Manufacturer Base Warranties. Decision Sciences, 43(2), 341-367. Huang, Y.-S., Huang, C.-D. & Ho, J.-W. (2017). A customized two-dimensional extended warranty with preventive maintenance. European Journal of Operational Research, 257, 971-978. Jiang, B. & X. Zhang. (2011). How Does a Retailer's Service Plan Affect a Manufacturer's Warranty?. Management Science, 57(4), 727-740. Khiabani, V. & A. Rangan, Extended warranty policies with varying objectives. International Journal of Industrial and Systems Engineering, 10(4), 430-450. Kumar, U. and G. Chattopadhyay, Mathematical models for analysis of extended warranty, in The fifth Asia–Pacific industrial engineering and management systems conference 2004: Gold Coast, Australia. p. 12–15. Meyer, T., Ernst, A. T. & Krishnamoorthy, M. (2009). A 2-phase algorithm for solving the single allocation p-hub center problem. Computers & Operations Research, 36, 3143-3151. Muckstadt, J. A. (1973). A Model for a Multi-Item, Multi-Echelon, Multi-Indenture Inventory System. Management Science, 20, 472-481. Muckstadt, J. A. (2005). Analysis and Algorithms for Service Parts Supply Chains, Springer Series in Operations Research and Financial Engineering. Özkır, V. & Balıgıl, H. (2012). Modelling product-recovery processes in closed-loop supply-chain network design. International Journal of Production Research, 50, 2218-2233. Pishvaee, M. S., Farahani, R. Z. & Dullaert, W. (2010). A memetic algorithm for bi-objective integrated forward/reverse logistics network design. Computers & Operations Research, 37, 1100-1112. Shahanaghi, K. & M. Heydar. (2013). Two-Dimensional Extended Warranty Cost Analysis for Multi-Component Repairable Products. International Journal of Mathematical Models and Methods in Applied Sciences,. 7(3), 247-256. Sherbrooke, C. C. (1968). Metric: A Multi-Echelon Technique for Recoverable Item Control. Operations Research, 16, 122-141. Sherbrooke, C. C. 1986. VARI-METRIC: Improved approximations for multi-indenture, multi-echelon availability models. Oper. Res., 34, 311-319. Talbi, E.-G. 2009. Metaheuristics: From Design to Implementation, Wiley Publishing. Tong, P., Liu, Z., Men, F. & CAO, L. (2014). Designing and pricing of two-dimensional extended warranty contracts based on usage rate. International Journal of Production Research, 52, 6362-6380. Topan, E., Bayindir, Z. P. & Tan, T. (2017). Heuristics for multi-item two-echelon spare parts inventory control subject to aggregate and individual service measures. European Journal of Operational Research, 256, 126-138. Wang, W. (2012). A stochastic model for joint spare parts inventory and planned maintenance optimisation. European Journal of Operational Research, 216, 127-139. Wang, Y., Cohen, M. A. & Zheng, Y.-S. (2000). A Two-Echelon Repairable Inventory System with Stocking-Center-Dependent Depot Replenishment Lead Times. Management Science, 46, 1441-1453. Wu, S. & P. Longhurst. (2011). Optimising age-replacement and extended non-renewing warranty policies in lifecycle costing. International Journal of Production Economics, 130(2), 262-267. Yeh, W.-C. & T.-J. Hsieh. (2011). Solving reliability redundancy allocation problems using an artificial bee colony algorithm. Computers & Operations Research, 38(11), 1465-1473.